Thymus vulgaris is the variety of this herb used most widely in cooking. Grown mostly as a culinary herb for its value in many cuisines some varieties are also said to have medicinal qualities. Although a number of varieties are best known as a culinary herb for centuries, some species also make wonderful garden plants, others are good ground cover plants. Thymus mastichina is grown for the essential oils, it is also known as Spanish marjoram and oil extracted is called ‘oil of majoram’. So we have the well known Thymus vulgaris, the lemon scented variety and variegated species. Many varieties more are available for sale online in Australia than appear in most nurseries. Originating in Mediterranean climates this is a hardy plant once established. Used extensively in English, French and Mediterranean cooking. Many Thyme varieties grow well in containers and some also suited to garden borders and rockeries. The amount of sun, and the soil moisture requirement do differ, in general they require they following conditions. Regular pruning of some varieties to prevent to much woody growth. A little fertiliser each year. Some water during long dry periods. A well drained soil is essential for growing thyme some varieties require better drainage than others. This is a plant that grows well in pots, and we recommend terracotta pots as they do drain well. You can also grow some varieties in the rock garden others are suited to growing between pavers. Plants are best watered in using a liquid seaweed fertilizer. They require little extra after this. A rock mulch is often used to create a good look around plants. For drying, Thyme is best harvested just before it begins to flower. This is when the plants have a high level of oil and therefore flavour. It can easily be dried by hanging it in the shade. If you wish to use it fresh, pick at any time of the year. Although all species will come back well each year for harvesting, they still respond to pruning. After flowering is a good time for a light prune, and again in late summer. It is essential not to cut back into old wood as most species of these valuable garden plants do not respond well. After a few years this is a plant that tends to become a little woody, say after 3 – 4 years. It does however spread slowly and will send down roots, so dig up, divide and replant cuttings from the younger growth. As for growing most species in the shade, they will grow, but it will be thin and leggy and not produce much in the way of foliage, so lots of sun. Thymus vulgaris – Common garden thyme. ‘Jekkas Thyme’ – Named after Jekka McVicar, early flowering and great tasting. Thymus citriodorus – Lemon thyme. 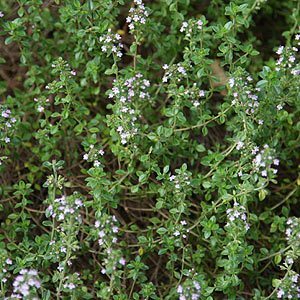 Thymus nummuralis – Pizza Thyme. OTWAY HERBS (03) 5237 6318. Large range of Thyme plants.